The Winchester Family Business - Preview and Episode Discussion - "And Then There Were None"
Preview and Episode Discussion - "And Then There Were None"
After last weekâ€™s very funny episode, laced with mythology on heavenâ€™s civil war, this weekâ€™s episode seems to slow things down a bit. No angels this time, and no mythology, but a very, very nasty monster compliments of the Mother of All and a group of hunters out to stop it. Quite a few guest actors reappear in this episode in recurring roles. 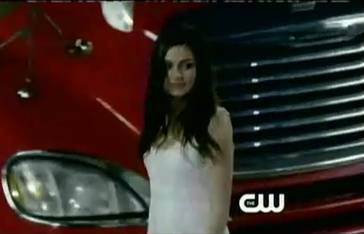 The CW released a preview clip and trailer for the episode. The preview clip shows a very concerned Bobby, as FBI Agent Willis, showing up at a really gruesome multiple murder crime scene, but heâ€™s the second FBI agent to arrive. The first one is Rufus Turner, which gives Bobby quite a surprise. Rufus also appears to be checking out the situation which, as he describes it, is â€™31 flavors of crazyâ€™. The duo (yeah, Bobby goes along with Rufus) team up with Dean and Sam for the hunt, and that brings up an interesting issue. 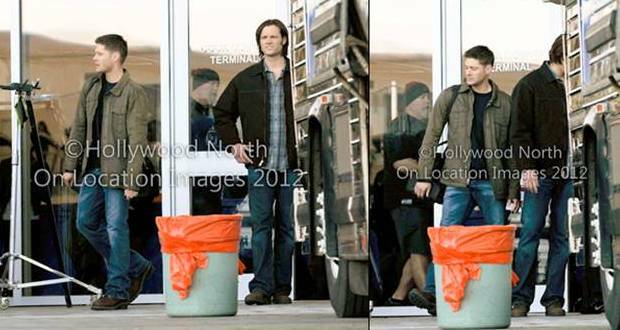 This is the first episode we see Bobby and Sam together since Samâ€™s soul was restored. Bobby had some lingering reservations about Sam then and, given Sam had tried to kill Bobby, thatâ€™s understandable. Wonder if Bobby has resolved those issues or if they play a part in this episode. But there seems to be problems with that to, as Samuel and Bobby get into a heated discussion over how to handle the caseâ€¦.that can throw a monkey wrench into the alliance. Really, I hope Bobby has more than that on his mind with regards to Samuel. Maybe ask some questions like, â€œWho the hell are you? How did you get here? Where did you come from and how could you treat your grandsons like you did?â€ Little stuff like that. (Smile) Whatever happensâ€¦my moneyâ€™s on Bobby! And who knocks down Rufus! Dean looks so concerned in the photo as he gently helps Rufus up. Rufus doesnâ€™t seem to be too appreciative though, and I love the â€œI ? To Polkaâ€ sign on the locker. Seems Bobby and his partner separated for a while and going off on your own in the face of such a deadly foe is never a good idea. What else is in the trailer? Well, from the looks of it, a lot of confusion, uncertainty and fear! This weekâ€™s episode is going to be a whole other kind of mind trip. It suggests the MOTW the hunters will be dealing with can sneak into their heads. We get glimpses of Dean, Sam and Rufus starring down the barrels of guns (some aimed at each other), sound and dialogue distortion, images popping in and out of clarity, and a lot of very bewildered people. We also see a woman â€˜whisperingâ€™ in a manâ€™s ear (or worse), and he doesnâ€™t seem to please about it! Bobby wrapped in duck tape being electrocutedâ€¦. and it sure looks like Dean and Sam are doing the deed. 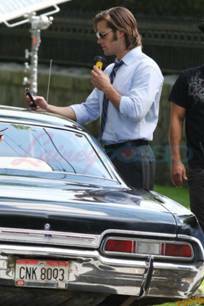 Dean shouting, â€œItâ€™s not in me!â€â€¦..
Lots of BTS photos for this episode, but the most concerning is the funeral pictures. 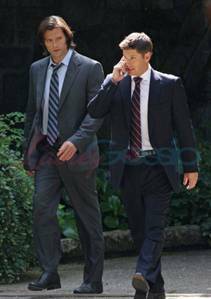 Rumor has it we have a death in this episode as we see Bobby, Dean and Sam very somberly standing in a grave yard. We havenâ€™t had a death in a while, so weâ€™re due. Besides this is the last episode before the series goes into a 5 week hiatus, and they always want to leave us sad. So who bites the dust? Rumor has it that itâ€™s Rufus, and based on the photo of Bobby symbolic pouring Johnny Walker Blue Label on the grave, I would tend to agree. Besides I really donâ€™t think Dean, Sam and Bobby would be that sad over Grandpaâ€™s demise which is the other character speculated to be the possible death here. I donâ€™t know about you all, but if they kill Rufus off, I am going to be very sad. Heâ€™s one of my favorites and I really am tired of all the characters I like being axed. Canâ€™t we keep anyone? That being said, no one really stays dead on SPN, but it would be nice if we could count on a few characters being impervious to â€˜getting the hookâ€™. I live in hope that the funeral scene turns out to be an error of some kind, a flashback, a hallucination, a misdirectionâ€¦.whatever. Some BTS photos were also taken by Christine Kilpatric. She has some nice shots of Beaver and Pileggi. He also mentioned that practically everyone was sick on set while this episode was being filmed, everyone but Jared that is, so the voices in this episode should be interesting. Mike Rohl directed the episode, his second for season sixâ€¦the first, â€œAppointment in Samarraâ€. He has direct eight other SPN episodes including â€œMy Bloody Valentineâ€, â€œOn the Head of a Pinâ€, and one of my personal favorites, â€œThe Monster at the End of this Bookâ€. He brings some powerful talent to the series and some really heartfelt emotional scenes to the episodes. Iâ€™d have my tissues ready! Brett Matthews penned this episode which is the third script he has worked on this season, the others, â€œLive Free or Twihardâ€ and â€œCaged Heatâ€ (teleplay and story). He co-wrote the comic miniseries "Those Left Behind", which bridged the gap between the TV series, â€œFireflyâ€, and its feature film follow up, â€œSerenityâ€â€¦.some of the greatest SYFY adventures ever. You may also recognize his name from his work on "Buffy the Vampire Slayer". CW released seven HD photo stills from the episode. You can see them all in our Photo Gallery. 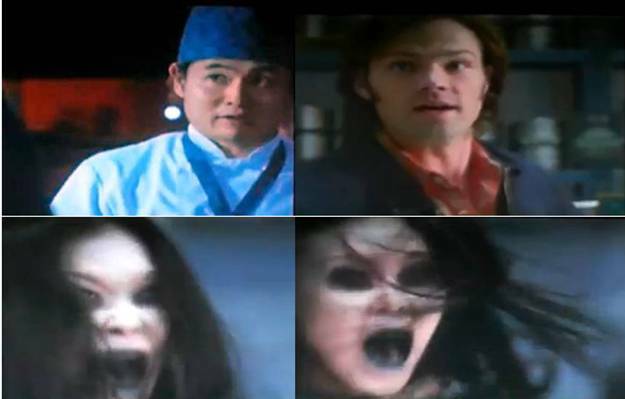 The CW promo videos for the episode are below. So many ways the story can go here, but it doesnâ€™t appear to advance any mythology as neither Cass or any other angel seems to appear in the episode. There can be a lot of interplay between the characters as conflicts between Sam and Bobby and Dean and Samuel have been mentioned in past episodes and so far not answered. Iâ€™d like to see them deal with the conflicts at some level. They all have a common cause in defeating the monster, so best to get all differences resolved. As for the MOTW, the invasion of the body scenario is not new, and neither is the worm crawling in and out of the ear, although it isnâ€™t always a worm that is the invaderâ€¦..insects are high on the list too. It has all been done before, but no matter how many times I see it, it is still very freaky. A number of posts have remarked how this episode reminds them of â€œCroatoanâ€, and that was a scary episode! Dean was drawing down on everyone and I canâ€™t say that I blame him, then or now. No question everyone is warily of everyone else in this episode as nobody seems to know who is infected and who isnâ€™t. And Iâ€™m guessing Bobby gets the monster at some point and the boys â€˜shockâ€™ it out of him. I also am going to guess that Samuel becomes infected and goes psycho on everyone. It will be interesting to see if the boys save him or not and what happens to Gwen. Both she and Grandpa are really loose ends now. Samuel was initially hunting for Crowley to get Mary back, but with Crowley gone; that seems to be a dead end. And we still donâ€™t know how Samuel was â€˜pulled down from heavenâ€™ or how Sam and he hooked up, so maybe that will be revealed here. Again, the season is winding down, so Iâ€™d like to get some answers to some of these subplots they have started. Now is a good time! The title of the episode, â€œAnd Then There Were Noneâ€, is named after the chilling Agatha Christie mystery novel of the same name. The book depicts the unexplained deaths of ten people, all mysteriously murdered one by one, but all with a common thread that tied them together. Given this episode is about a number of hunters all with a common cause of defeating the Mother of All, Iâ€™m thinking the take home message from the title is deaths in the group will occur. 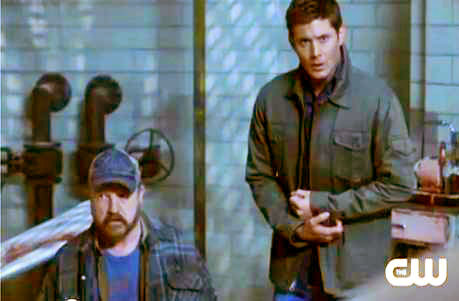 We know the boys and Bobby attend a funeral so at least one hunter dies, but no reason to assume it will only be one. Mike Ausiello posted a very general spoiler the end of January. He said, â€œThe Grim Reaper will set his sights on two recurring characters in the not-too-distant future.â€ Maybe more than one hunter dies this episodeâ€¦Grandpa maybeâ€¦or Gwen. It certainly would fit the title and I, for one, wouldnâ€™t miss Samuel. He certainly has overstayed his welcome for me. Happy episode all! Come back and tell us what you think! Hey everyone, if you have a twitter account follow me at @sblgrn. This is no doubt going to be interesting. 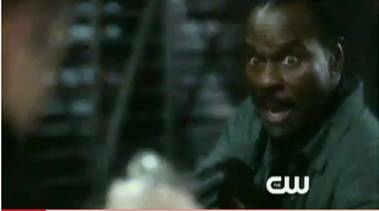 With the promos the CW released, I'm wondering - is it Sam who comes up with a crazy plan? 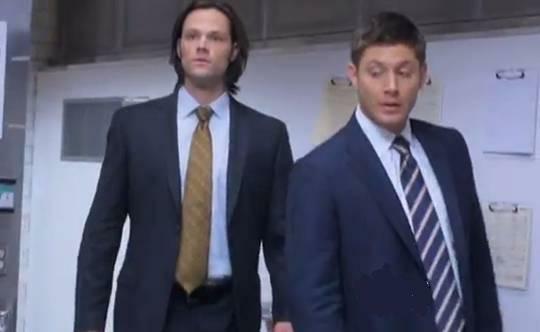 There's one promo where all the guys look at him with an are-you-out-of- your-mind-? expression. Wanted to place it here, but somehow that wasn't possible. I think it's not about the Monster of the Week anymore, but about what happens in the relationships of these men. And that has, for me, always held the strongest appeal. I know exactly what photo you mean, Jas. I thought I had it in the article, but I was playing around with so many screen caps, I must have lost it some how. Rats. Hope it's Grandaddy Eyebrows who snuffs it, I like Rufus and he and Bobby are priceless together. What is it with SPN and the continual offing of everyone who isn't SAm, Dean or Bobby? Is there some teeny-tiny print clause in the contracts that say if the writers slip up and let you survive for too long the CW has to buy you a big cake and give you a zillion dollers a year for life? Thanks for the recap. It sounds like a lot is going to happening in tonight's episode. I am most interested to see what happens when Dean and Sam meet back up with Samuel and Gwen. Given Samuel's betrayal of the boys, I certainly hope this episode pays service to that and we see some kind of fireworks. Trying to go into this episode without many expectations. Also, wasn't this the episode that everyone was really sick while filming? They were sick before and after the SF Con and this was the episode they were filming at the time. So, if this is that episode, it will be interesting to see if we can detect illness in anyone. After watching all that, I pulled out one of my sister's favorite songs. It's a real thrasher from Ice-T.
"ON WITH THE BODY COUNT!!!!" I mean wow. So much to absorb. I love the lock down, thriller aspect of this, but I think I need a flow chart to follow all the dynamics. Possessed Dean kills Gwen, not possessed Sam kills Samuel, possessed Bobby kills Rufus, and man did do much resentment from the past get brought up. I guess that was a convenient way to get rid of the Campbells. What would Mary think? Easy, her boys exist in one fucked up situation. Anyone think that isn't the last we've seen of Samuel? After all, he was brought back before. I'm sure there's a door for that. I watched this ep with my sister & we definitely both gasped when Rufus was stabbed. Totally did not expect it. Jim Beaver was amazing!! One of his best episodes I've ever seen. While it was a great episode I think that coming after last week kind of diminished it if that makes any sense. Its hard to follow an ep like that. Gwen and Samuel didn't bother me, except for the way they went. 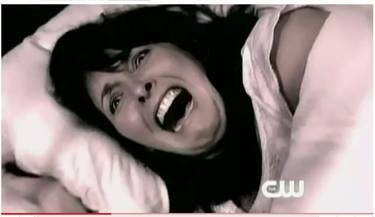 Never expected Dean to kill Gwen, but he was possessed at the time. Won't miss them at all. Oh happy days. Well not really happy days due to unjustly enforced upcoming hiatus but it was definitely a happy morning! What a great episode. A real spring clean of characters and weâ€™re left with the bare essentials again, Sam, Dean & Bobby. Iâ€™m going to miss Rufus, he was so fecking droll but as with Dean, the outer facade was just a cover for a hell of a lot of beneath the surface stuff. 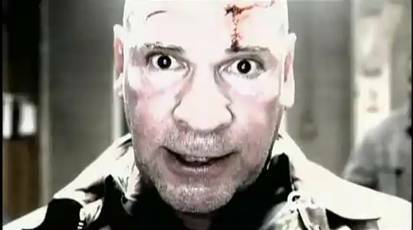 That being said, he had some of the best lines of the night â€˜Iâ€™m down on three toes too, fyi!â€™ and â€˜Itâ€™s not rocket surgeryâ€™. Rufus, you are (were) brilliant and will be much missed. Deanâ€™s blanket forgiveness was so cathartic, and much needed. Of everyone, itâ€™s Dean that Sam is most worried about letting down and even though heâ€™s adamant what heâ€™s done is unforgiveable (especially given what grandpa was saying, grrrrr) Iâ€™m sure what Dean said acted as a sort of balm for him so fair play to you Dean. (For me, it shows a far bit of character development because Dean does (did) seem to have problems in letting go of the past.) Life is too short, family and friends are too few, thereâ€™s nothing to be gained by holding grudges. Brain worm thing reminds me of that X-Files episode, (being stuck in the Arctic, â€˜Iceâ€™ I think) and this alien worm(?) made them murderous. Awesome episode (both this and that). And bye bye Samuel. I was sure Dean was going to be the one to kill him (as what the Dean says, the Dean does) but it seems kind of fitting that Sam was the one to kill him. Also prophetic words when Sam told Samuel heâ€™d put a bullet in his head. Interesting that Sam was the only one who wasnâ€™t possessed (or whatever you call it when thereâ€™s a bug flubberworm floating around your central nervous system) when he killed â€˜familyâ€™. Also interesting that Bobby and Dean now have an added insight into what it feels like to have your body do things against your will. Maybe this aided in Deanâ€™s forgiveness and in Bobbyâ€™s more relaxed attitude toward Sam. Ooooh and when Samuel was offering to give Sam the means by which to start chipping away at the wall, my heart did skip a beat or seven. The fact that Sam stopped him dead (literally) shows how much the first memory of hell completely unnerved him and he has no intention of revisiting it. Hopefully if (when) the wall goes it wonâ€™t be as a result of Sam intentionally picking at it. I wonder if thereâ€™s still a slight element of mistrust towards Sam (old habits and all that). 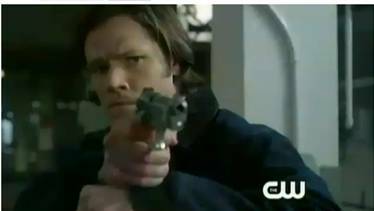 I know in the confines of the episode it probably wasnâ€™t unexpected but I think itâ€™s cool that at no stage did Sam point a gun at Dean (though I have crappy resolution on my computer and might have missed it), whereas everyone else, at one stage or another, did raise a gun to Sam. Deanâ€™s â€˜Fists of Doomâ€™ really need to be listed as weapons of mass destruction. How many people has he rendered unconscious with those things already? 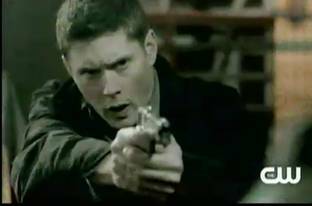 Two more of the best lines: â€˜Define one hundredâ€™ and â€˜...and Dean will watch meâ€™. Awww. Episodes like this make me really glad I get up so early on a Saturday morning to watch. Ah, itâ€™s a great show. I found the episode very suspenseful, and I certainly liked the four hunting together. A ticked off Dean is always a pleasure to watch. I particularly like that the writers have remember than Dean is leader of TFW and that that is a thread that seems to be remembered this season. 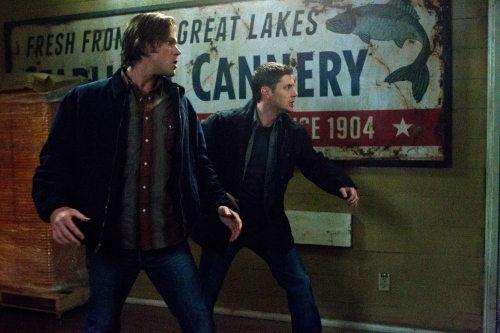 I liked the brothers working together, that Sam has matured and is serious about protecting Dean's back. My favorite part was Dean stepping up to electrocute Bobby and sweet Sam having to turn away. 1) The Campbell storyline was totally undeveloped, so I have to question why the Campbells were even in the season. So, Sampa was a douche, completely changing his character from ITB, and I guess we are to believe that Crowley was able to enter Heaven and get Sampa out. I'm still not willing to buy that. 2) The big reveal was only that Eve wanted to take over Earth and kill humans. I knew that back way back at the beginning of the season. But in this episode, Eve creates a worm to monster possess people in a cannery to lure hunters so she could tell them that she was really mad and they were all going to be punished by death or eating of their children because of it. 3) I'm not sure if Dean's clean slate speech was for the Bobby/Sam distrust or for Sam's benefit or for everyone's benefit. 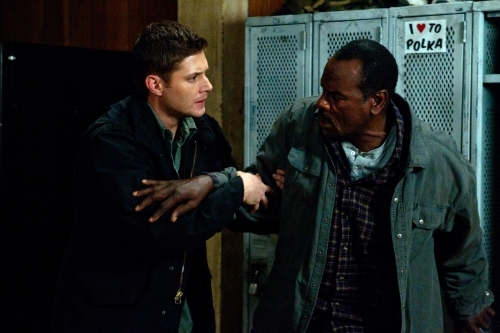 I didn't see Bobby have any distrust issues with Sam this episode, so perhaps that was just dropped. What I did like was that the speech was just so Dean, except he seems to finally be stepping into the hunter role with confidence. He's willing to do whatever needs to be done to win this Apocalpyse II: The Monster Version without second guessing himself. I like that. 4) I thought killing off Rufus was a complete waste of a good recurring character. 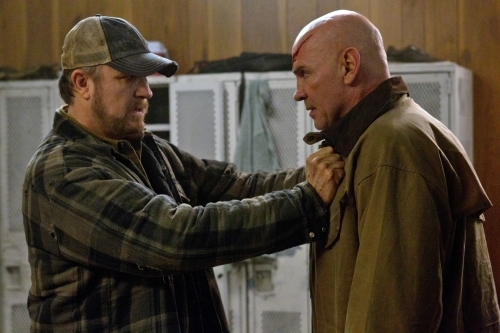 I really saw no need for it because Rufus added depth to the hunter community, was great playing off either Dean or Bobby, and was a fun character. Bobby used to put Dean in his place, but with Rufus, that expanded to Rufus putting Bobby in his place. I liked that. 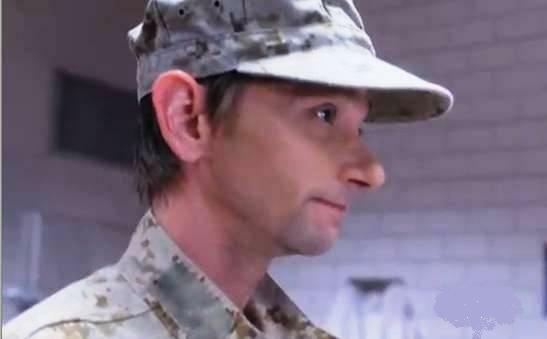 Keeping Rufus alive would have given the show a way to explore more of Bobby's background occassionally, like what happened in Omaha, and added more fun dimension to Bobby's character. In my view, having the boys occasionally learn more about Bobby would have been interesting for the audience and also given us an expanded view of the boys' universe. Killing him was a waste of a good character, I trhough. I just can't take GG Mother seriously. I laugh every time I see her, but that is a small quibble. Overall, and despite some holes and no closure to ever killing the monster, I like the episode for the fact that the brothers and Bobby are working together. Very disappointed they killed off Rufus.